Auli is the best city opted for skiing by the people of the state of Uttarakhand where it is situated. The city of Auli rests in the lap of snow that is spread all around the peaks of the Himalayan Mountain that is located throughout the city. 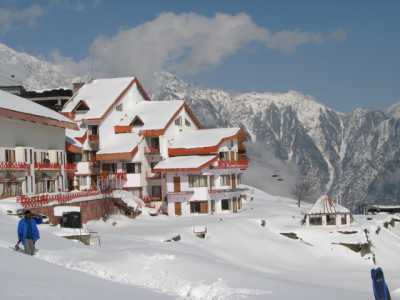 Auli is situated in the chamoli district that is near a very famous sacred placed called Badrinth. The height of the city (Auli) is approximated to range from two thousand five hundred to three thousand fifty meter above sea level. Apart from snow covered areas, the city of Auli is full of coniferous and oak forests which create a widened view of the city. This view makes it the paramount of all other cities of the states. Auli is a fun oriented and adventurous tourist sport. The most famous sport that played in the heart of Auli is skiing. Since skiing requires hilly mountainous and snowy areas, what can a better option than Auli? The mountains of Nanda Devi and mana parvat are the surrounding area of the skiing locality which provides an awesome view for the individuals who love to ski in the hills. The easiest and fastest way to get there is by an overnight train from Delhi (the capital of India) and then a hired car or taxi from Delhi to Hardwar. Via cab or car you will reach Hardwar by morning and you can start from Hardwar in the morning towards Auli. Although there are other way to reach Auli by break journeys via air, rail, road or cable car. This entry was posted on Tuesday, June 15th, 2010 at 5:29 pm and is filed under Auli. You can follow any responses to this entry through the RSS 2.0 feed. You can leave a response, or trackback from your own site.